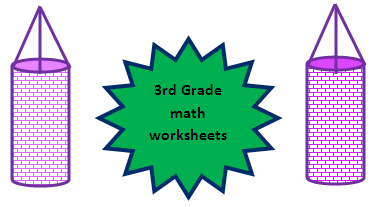 In this page 3rd Grade Math Worksheets you can find more worksheets in the third grade.Like this you can find more than 10 worksheets in each category.In this worksheets you can find mixed question in all the topics. Each of the 3rd grade worksheets are given in the form of quiz. Online math 4 all gives collections of work sheets from all the grades.You may practice each set of worksheets and also you check your answers that will help you to evaluate the knowledge.Teachers and parents also can help the children to practice the work sheets and improve their knowledge. If you are having any difficulties to understand any step in the solution please Contact us via mail. We will send you step by step detailed solution.In the topic basic math you can learn the basic topics more clear. For the third grade students we can start teaching the concept multiplication and division.They already know the concept of addition and subtraction in lower grade.We can also teach how to tell time.